Badger: Badger style, pure China bristles, have the appearance of badger hair with the natural flex, taper and flag of pure China bristle. The pure China bristle is ideal for applying marine varnishes, urethanes and oil-based enamels and stains. The hand-formed "chisel tip" provides a sharp cutting edge while the soft flag tips ensure smooth paint application. Bassine: Obtainable in medium, prime or extra prime stiff grades. Bassine offers superior stiffness and is naturally resistant to water. This bristle is very dark brown in color. 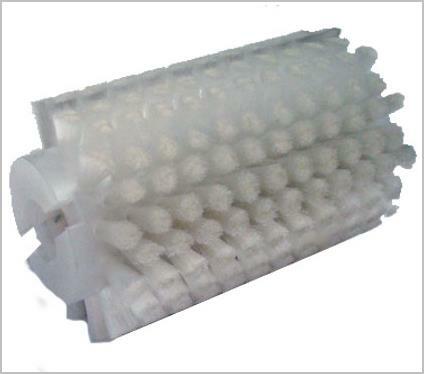 Its coarseness and good water resistance make it ideal for stiff scrub brushes and is widely used in conveyor cleaning brushes. Cellulose: Cellulose sponges are made from wood pulp. They have excellent liquid absorption properties. Corn Fiber: Is made from 100% natural corn fibers. The fibers are bound together in the construction of the broom. 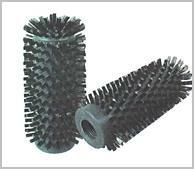 China Bristle: Are blends which include Black China bristle, White China bristle and Ox hair brushes. All these natural bristle types can be combined with each other or with synthetic filaments. Black China Bristle is blended specifically with the professional painter in mind. 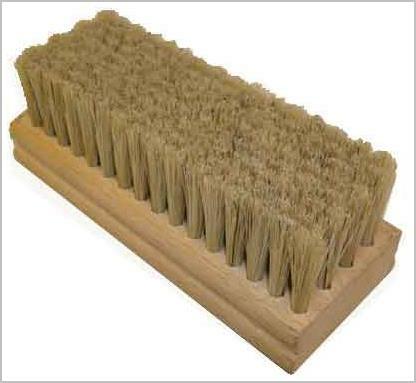 The naturally absorbent bristles are perfect for any oil-based paint, stain, and some varnishes. Smooth finishes are produced with these soft, supple bristles. White China bristle typically produces a smoother finish so they're suitable not just for oil-based paint, stain, and varnish, but also for polyurethane, lacquer, and shellac. 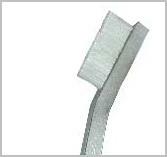 Hog Bristle: Is strong and fairly stiff, with a natural taper and a split end (flagged). This material is resilient and has excellent durability. It is water resistant and heat tolerant to 370˚F (188˚C). 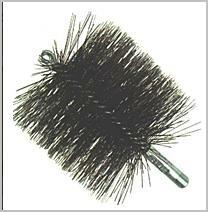 Hog bristle brushes are the perfect tool for ESD applications. Horsehair: Horsehair's soft to slightly stiff texture provides for scratch-free cleaning with very good durability. The material is excellent for picking up and carrying dust and fine powders and for polishing, dusting or cleaning surfaces without being abrasive. Horsehair can be mixed with other natural fibers, synthetics or wire materials for specific application requirements. This material can be used at a wet operating temperature up to 370°F (188˚C). Mohair: Is a blend of soft natural angora mohair with synthetic fibers. It produces the smoothest finish possible as a roller cover. It is recommended for use with gloss and high gloss coatings. Ostrich Feathers: Natural gray feathers attract and hold dust. They can be used on glass, chandeliers, screens, frames, plants and delicate surfaces without scratching. Palmetto: Produced from the Florida Palmetto Palm. It is coarse, reddish in color and oil-treated for wet applications. Palmetto is a quality bristle brush fiber, widely used in deck and can scrubs, garage sweeps, whisk brooms. Palmyra: A cinnamon colored fiber produced from the base of the leaf stalks of the India Palmyra palm. It has a medium stiff to stiff texture and is light to dark brown in color. It is finer, less stiff, more brittle and a lower quality than bassine. This fiber is used in garage floor brushes, fender washing brushes, deck brushes and scrub brushes. Tampico: Is produced in Mexico from the stalk of the Agave plant. Tampico has exceptional water retention characteristics, excellent biodegradability, superior heat, water, acid and alkali resistance. Tampico bristle has a soft to medium texture and is off-white in color. 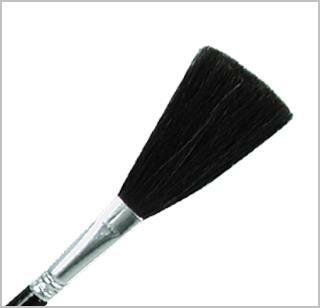 It is often dyed and blended to give the desired effects to a bristle brush. The porous fibers absorb water and work well wet or dry. This material is more aggressive than nylon or horsehair. It is used for removing surface particles and tool marks, dusting, wet scrubbing, cleaning and spreading liquids. It is excellent for removing light feather burrs and for light edge blending when used with a compound. Its heat distortion temperature is 283˚F (139˚C). Union Fiber: Is a mixture of two or more materials; usually Tampico and Palmyra. It has a medium stiff texture and is a mix of light and dark brown fibers. It is used for medium scrub applications. Brass: Normally contains about 70% Copper and 30% Zinc. The bristle wire is the softest metal fiber available. The bristle wire comes either straight or crimped. It is used for light to medium cleaning and luster finishing. It can be used up to temperatures of 500°F (260°C). Carbon Steel: Is available both tempered and non-tempered as well as high carbon and low carbon versions, in a variety of sizes, straight or crimped. Carbon steel is a widely used metal fill material. It has excellent cutting ability and fatigue resistance for long brush life at a low cost. It is used for general-purpose cleaning, rust removal, deburring, edge blending and roughing for adhesion. It can be used up to temperatures of 300°F (148°C). Phosphor Bronze: C51000, phosphor bronze is made up of approximately 92% Copper, 4.7% Tin, 2% Phosphorous, 1.3% Zinc, and trace amounts of lead. It is non-sparking and about a fifth as conductive as Copper, stronger than brass (F73 Rockwell) and lasts longer. This material resists corrosion and fatigue due to flexing. It can be used up to temperatures of 500°F (260°C). Stainless Steel: Type 302/304/316 stainless steel is used for wet and no rust applications and comes either straight or crimped. It is highly corrosion and heat resistant. Unlike carbon steel, stainless steel does not leave after-rust deposits when used on stainless steel, aluminum and other high-strength alloys. Stainless Steel is used in corrosive environments for general purpose cleaning, rust removal, deburring, edge blending and roughing for adhesion. It is FDA approved and widely used in medical brushes, pharmaceutical brushes and food service brushes. It can be used up to temperatures of 800°F (426°C). Note: The austenitic 302/304/316 steel used in our brushes is cold worked (drawn) to achieve the desired tensile strength. This results in the stainless steel becoming somewhat magnetic. This magnetism is normal and is not an indication that the wire is not stainless steel. EPDM (Ethylene Propylene Diene Monomer): Is a copolymer of ethylene, propylene, and usually a diolefin. Ethylene Propylene Rubber possesses excellent resistance to ozone, sunlight, and weathering. It also has very good flexibility at low temperatures (superior resistance to cold and heat), has good chemical resistance and good electrical insulation properties. Foam: These brushes feature a synthetic foam pad for maximum material absorption. It is a great brush for painting crafts and doing touch-up work. Foam brushes are lower cost than bristle brushes and can be used once or washed and reused several times before deteriorating. Microfiber: Is a synthetic fiber. The most common types of microfibers are made from polyesters, polyamides (e.g., nylon, Kevlar, Nomex, trogamide), or a conjugation of polyester, polyamide and polypropylene. Microfiber is used to make mats, knits and weaves for apparel, upholstery, industrial filters and cleaning products. The shape, size and combinations of synthetic fibers are selected for specific characteristics including, softness, toughness, absorption, water repellency, electrostatics and filtering capabilities. Moss Rubber: Nitrile rubber is made by combining two compounds into one through a chemical reaction process. The resulting butadiene rubber material is not just oil resistant, but also features good tear and abrasion resistance. This soft, double foam rubber blade is designed for use on uneven, grouted and smooth surface floors. Moss rubber is resistant to animal fats, salts, diesel oil, gasoline, propane, ammonia and more. It is ideal for markets, warehouses and food service facilities. Neoprene: Is the ultimate general-purpose elastomer. Neoprene is more resistant to water, oils, heat and solvents than natural rubbers. It is known for its durability and resistance to water, weathering and tearing. Nylon: Has excellent abrasion, set, chemical and resistance and bend recovery. It has good temperature resistance (high melting temperature, high short-term use temperature) and good stiffness, but softens in water. It is FDA approved. 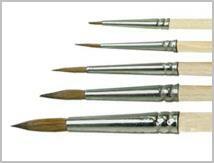 Nylon brushes can be used for oil-based paints, but they are also recommended for latex or water-soluble paints. 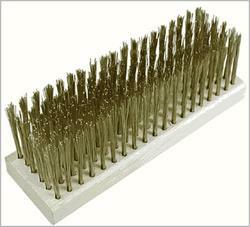 Nylon bristle brushes, however, should never be used with shellac, lacquer, contact cement or paint remover. PEEK (Polyether Ether Ketone): A durable thermoplastic that offers excellent chemical resistance, does not absorb moisture and is ideal for high-heat and corrosive environments. PEEK provides excellent flexural and tensile strength and will work in continuous temperatures up to 500°F (260°C). It is a great alternative to Nylon for use in extreme chemical and heat applications. Food service brushes can be made from PEEK where high temperature material is required, such as cleaning kitchen oil in a fryer. PET (Polyethylene Terephthalate): Is a recycled material made of thermoplastic polymers. PET resists alkalis, diluted acids, alcohol and organic solvents. PET has a melting point of 480˚F (249˚C). Polyester: Is a polymer whose features of toughness and high temperature resistance resemble those of nylon, but unlike nylon, polyester is noted for its ability to recover without whip or slapping action and will not mat. Polyester has excellent resistance to all acids, alkalis, alcohols, gasoline, benzene and most cleaning solvents. Polyester resists mildew, bacteria and fungus growth. FDA approved. It has a maximum short-term use at 320°F (160°C) and a maximum continuous use at 285°F (140°C). Polypropylene: Is a versatile, stiff, low cost filament used for a wide variety of applications. Polypropylene will not absorb moisture or odors and sheds dirt easily. It has excellent wet stiffness, abrasive tip cleaning action, is non-brittle, and is inert to most solvents, oil, acids, and chemicals. It is, in fact, one of the most chemically resistant synthetic filament materials available. It has a maximum short-term use at 225°F (107°C) and a maximum continuous use at 175°F (79°C). Polystyrene/Styrene: This material replaces natural bristles for use where chemical resistance is needed. 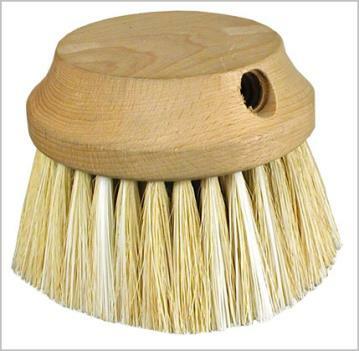 Its stiff aggressive properties make it ideal for utility brushes, coffee urn brushes, deck scrub brushes, floor and garage brushes. Polystyrene bristles wear longer, perform better, and carry a comparable price tag to natural bristles. 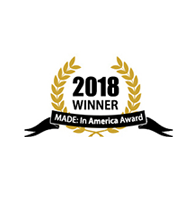 Contact Milwaukee Dustless > today to receive a custom quote or to learn more how our products can fit your applications!